Head-on crashes: spectacular shunts: miraculous near misses. 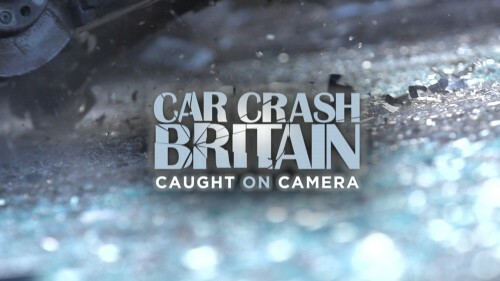 Car Crash Britain is a unique and dramatic insight into the real-life drama happening on Britain’s roads every day. Watch the most shocking road accidents, the worst crashes and the great escapes – astonishing moments, all filmed by the people actually involved in them. With shocking road accidents now being captured on bike helmet and car dashboard cameras by the people at the centre of the action, many collisions are now being recorded and shared online; from motorway pile-ups to hit-and-run incidents and out-of-control cyclists. This four-part documentary series compiles some of the worst crashes, greatest escapes and most incredible moments alongside interviews with motorists and other road users caught up in the drama. In this programme we’ll see the most shocking road accidents, the worst crashes and the great escapes – astonishing moments, all filmed by the people actually involved in them. And we’ll talk to those at the centre of the drama playing out on Britain’s roads every day. All-new footage of Britain’s most shocking road accidents, jaw-dropping driving and miraculous near misses – caught on camera by the people at the very centre of the action. The real-life drama on the nation’s roads is captured by cameras on drivers’ dashboards, millions of bike helmets, smartphones and CCTV. Stories tonight include the dad who saved his daughter’s life in a motorway smash, the woman who came close to death when a car ploughed into a café, Britain’s worst parking mishaps and the man with the perfect answer to potholes. More incredible footage of spectacular crashes, great escapes, dreadful driving and amazing rescues – all caught on camera by Britain’s drivers, bikers and cyclists. Footage tonight includes the terrifying moment a woman found herself trapped in a car filling with water after crashing into a ditch, motorists who’ve discovered mechanics taking their cars on secret joyrides and Britain’s most hopeless learner driver.